On the south side of the River Liffey, Trinity College is an Ivy League-style university with shady quadrangles and atmospheric stone buildings. Here you'll find the famous Book of Kells, an illuminated manuscript written in Latin by Irish monks in 800 AD, which is decorated in ornate writing and drawings. 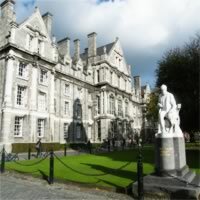 Trinity College is virtually the dead center of the city, and is surrounded by bookstores, shops, and noisy traffic. Nearby is the white colonnaded Bank of Ireland as well as Fitzwilliam and Merrion Squares, two little square parks surrounded by grand Georgian town houses. South of Trinity College, linked by Grafton Street, is St. Stephen's Green, with its 22 acres of landscaped lawns loved by locals on sunny days. The neighborhood is filled with impressive Georgian architecture and is home to Dublin's finest hotels, restaurants, and shops. West is Merrion Square, where Dublin's iconic doorways lend character to the elegant Georgian houses. Close by is the majestic Leinster House parliament building. West is Grand Canal for leafy waterfront walks to Portobello's neat Victorian red-brick terraces. 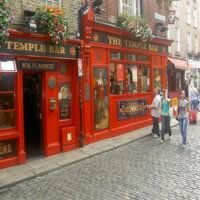 Wedged between Trinity College and the Old City, just south of the River Liffey, Temple Bar's 18th century cobblestoned street is Dublin's party hub, packed with bars, discos, and pubs. Temple Bar lies east along the river and has retained the medieval design of its streets, with the majority of the area open only to foot traffic. Temple Bar is home to several popular pubs and restaurants and many museums and art galleries, including the Gallery of Photography, the Irish Film Centre and the Temple Bar Gallery and Studios. Meeting House Square hosts the weekend food market. At night, this is largely the stamping ground of young tourists looking for lots of alcohol. 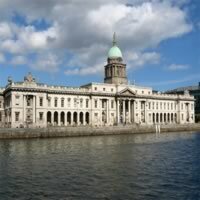 West is the Old City, dating from Viking and medieval times, the cobblestone enclave of the historic Old City includes Dublin Castle, the remnants of the city's original walls, and Christ Church and St. Patrick's cathedrals. Recently, Old City has also gained cachet for its hip boutiques where local designers sell their clothes. 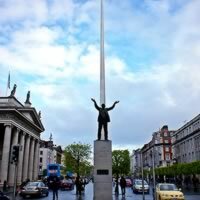 North of the River Liffey, O'Connell Street, filled with shops, is graced with statues of Dublin luminaries. Halfway along is the landmark General Post Office building, the center of the Easter Rising in 1916. Museums line the northern end. A westbound walk on the riverside Liffey Boardwalk passes the Italian Quarter's alfresco cafés at Ormond Quay, and the 18th century Four Courts. Once unfashionable, the Northside now buzzes with bars and an eclectic mix of multicultural restaurants, especially around Parnell Street. With four theaters in walking distance of O'Connell Street, this is Dublin's theater district. Once the center of Dublin's shipping industry, this is now a trendy address for hotels, bars, and clubs. The quays are actually a series of streets named after the wharves that once stood at water's edge. The quays start near the mouth of the Liffey and end in the green peace of Phoenix Park. Immediately south of the Grand Canal, this upscale suburb is just barely within walking distance of the city center. Primarily a prestigious residential area, it is also home to hotels, restaurants, and embassies, including the U.S. Embassy. Originally developed in Victorian times, the streets are wide and tree lined and houses are substantial and set back in vast private grounds. 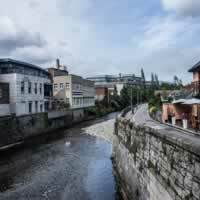 Of all Dublin areas, Ballsbridge has the least built-up and most private feel. Yet, despite the space and relative tranquility, Ballsbridge is only minutes away from the city center. To the south of the Liffey you'll find the essential Dublin attractions. Starting east at Dublin's main transportation hub - Heuston Station. North of the Liffey you'll find the famous Phoenix Park, the largest public park in Europe, and an often recommended spot for afternoon strolls. Families frequently visit Phoenix Park for the Rodrigues fruit bats or Moluccan Cockatoos of the Dublin Zoo. 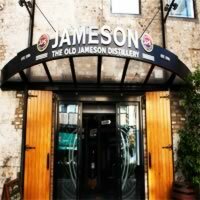 Dublin's northern half also contains some excellent Irish cultural centers, including the Dublin Writers Museum, which showcases the city's rich literary history, and the Old Jameson Distillery, which showcases another one of Ireland's favorite beverages: whiskey! At the eastern end of the River Liffey's north bank, bordering the renovated Docklands, the glittering IFSC is home to Ireland's financial powerhouses. Between it and the neoclassical Custom House, the startling life-size famine sculpture marks the spot where migrants sailed away to escape poverty. To the north, George's Dock's refurbished warehouses are home to boutique-filled malls with waterfront wine bars at Customs House Quay. Further east, the O2 entertainment venue (which has replaced the old Point Theatre) draws thousands for major live events.